« Did Paul invent the virgin birth? BRUSSELS (AP) — With British politics gridlocked and just 100 days until Brexit, the European Union on Wednesday triggered contingency plans designed to cushion some of the shock of a “no-deal” U.K. exit from the bloc. The EU measures, announced a day after Britain ramped up its own no-deal planning, are intended to alleviate “major disruption” to people and businesses in sectors including financial services, customs, air transport and climate policy. Britain is due to leave the EU on March 29, but it remains unclear whether lawmakers will approve the divorce agreement Prime Minister Theresa May’s government has negotiated with the bloc. Leaving without a deal risks plunging the British economy into recession and touching off chaos at the borders. The 14 EU actions include temporary one- to two-year measures to allow U.K.-EU financial services to continue and a 12-month provision to keep planes flying between Britain and the bloc. On Tuesday, the British government stepped up U.K. no-deal preparations, putting 3,500 soldiers on standby and warning thousands of businesses and millions of households to get ready for disruption. The government said the plans — which include chartering boats and stockpiling medicines — are a sensible precaution. But opposition politicians accuse the government of trying to scare lawmakers into supporting May’s Brexit deal. “No-deal would be a disaster for our country and no responsible government would ever allow it,” Corbyn said. Whether or not the UK accepts the Brexit deal that Theresa May wants Parliament to accept or not, the Europeans will not forget Brexit and will later take steps against the UK. LONDON — It’s the Brexit scenario that almost everyone dreads: Britain crashing out of the European Union with no divorce agreement and no arrangement for future trade. There would be no transition and an abrupt end to more than four decades of agreements. The consequences of the divorce are far reaching and affect nearly every aspect of society. E.U. law and policy influences trade, security, medicines, travel, workplace regulations and more. The shock waves of a “no-deal” Brexit would be felt across the British economy. The possibility of violence in Ireland is real, but there are actually worse scenarios than that. LONDON (Reuters) – British Prime Minister Theresa May will urge the devolved nations of Scotland, Wales and Northern Ireland to “listen to business” at a meeting on Wednesday and back her Brexit deal, which envisages continuing close ties with the EU. If the proposed deal is approved as is, it is not a total break from the EU (at least at this stage; see also EU approves Brino Brexit deal, but deal still needs approval by UK and EU parliaments). The EU will still be upset with the UK and later will further insist on outcomes that many in the UK do not want. If the UK Parliament does not approve the proposed Brexit deal on January 14, 2019 (or perhaps even later), the UK would either have to try to stop the Brexit somehow (some want another national vote), ask the EU for a delay, or exit the European Union without a deal. A no deal Brexit is often referred to as a hard Brexit. Many who voted for a Brexit seem to prefer a hard Brexit to Theresa May’s deal. But most in Parliament do not seem to want the UK to exit the European Union, so some like at least aspects of Theresa May’s deal. Even if there is a ‘hard’ (no deal with the EU) or ‘soft’ (May’s proposal) Brexit. or even if there is NO Brexit, all this Brexit talk has upset the Europeans and they will not forgive and forget. Europe is not going to ‘get over’ the Brexit and will one day take violent actions that most of those in the UK (as well as USA and Canada) will not consider possible (cf. Daniel 8:24-25, 11:39; see also USA in Prophecy: The Strongest Fortresses). 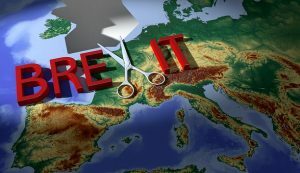 The long-term consequences of Brexit will include the elimination of the nation officially called the United Kingdom of Great Britain and Northern Ireland. This entry was posted on Wednesday, December 19th, 2018 at 8:00 am	and is filed under Prophecy.